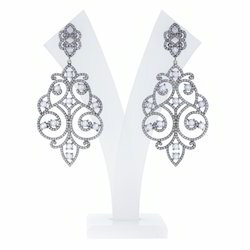 We Are Manufacturing Wide Range of Pave Diamonds and Gemstones, Flower Earrings, Filigree Earrings, Feather Earrings, Hoop Earrings, Snake Earrings, Ear Cuff Earrings, Hook Earrings, etc. All These Designs Are Available In All Colour Stones. In All The Customize Shapes and Sizes.